The Coast Guard wants to hear from those with ideas on how to stem the oil flow from the Deepwater Horizon well and deal with the spill’s consequences. Last Friday, the Coast Guard Research and Development Center, along with several interagency partners, issued a request from vendors, scientists, government laboratories, and nonprofits for ideas on how to stop, contain, and clean up the largest off-shore oil spill in U.S. history. Robert Brodsky writes that the broad agency announcement calls for the submission of white paper ideas on five distinct problem areas: tracking and detecting oil; controlling or shutting off the wellhead; developing traditional and alternative oil spill response technologies, damage assessments; and restoration. The proposals, which will be accepted for one year, also should include details of any previous testing and evaluation and the estimated price of implementing the solution. Papers will be screened based on scientific and technical merit, feasibility, deployability, the availability of the proposed solution and cost. 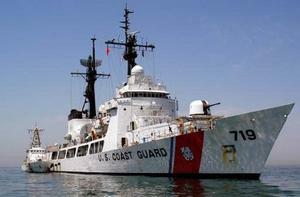 Small businesses are encouraged to submit their plans, although the Coast Guard noted work will not be set aside for any socioeconomic group. An interagency group comprising officials from the Coast Guard, National Oceanic and Atmospheric Administration (NOAA), Agriculture and Interior departments, Minerals Management Service (MMS), and Environmental Protection Agency (EPA) will review the white papers. If a plan shows immediate promise, the work group will forward it to Rear Adm. James Watson, the federal on-scene coordinator for the Deepwater Horizon response, for further action, including contract actions by BP or federal agencies. Brodsky notes that the solicitation represents somewhat of an about-face for the Coast Guard, which previously indicated it was not planning to hire contractors to respond to the oil spill crisis. BP’s inability to stem the flow of oil at the wellhead, however, could have prompted the Obama administration to seek outside solutions. As of mid-week, 17 companies, universities or individuals have expressed formal interest in submitting their proposals. Interested parties can submit their white paper here. The Coast Guard is not the only federal agency soliciting the help of contractors in responding to the spill. Interior issued a sole-source contract with the National Academy of Engineering to conduct an independent investigation of the root causes of the disaster. Interior’s Fish and Wildlife Service also issued a no-bid contract worth more than $83,000 to occupy fifteen hotel rooms on Alabama’s eastern shore for sixty days beginning on 16 May. The Food and Drug Administration, (FDA), meanwhile, is purchasing technology to clean animal tissue and swiftly to analyze odors and volatile organic compounds. Procurement experts suspect the government could begin turning increasingly to the private sector to contain the damage from the spill, often through sole-source contracts that can be issued quickly and with increased flexibility.